“This is more of the case by them wanting to go dark. The [Police Commission] President said they wanted to pick the chief before they meet with us,” Supervisor Ross Mirkarimi told CitiReport after being told that the Police Commission will not show up at a joint Police Commission-Board Public Safety Committee meeting set for this Wednesday. The Commission’s vote shuts the door on cooperation between Mayor Ed Lee’s administration and the Board of Supervisors at the same time that an era of new civility is being proclaimed. Underscoring the politics of the decision, CitiReport sources indicate that the Commission made its decision on a 4-3 vote, with the mayor’s appointees lining up to outvote the three Board appointees to the Commission. The Commission President’s claim that the decision was reached at its meeting last week also raised questions since the Commission’s agenda did not publicly notice a discussion or vote on the upcoming Board-Commission meeting. Mirkarimi, the chair of the Board’s Public Safety Committee, told CitiReport that the two bodies have held joint meetings several times in the past. The Wednesday meeting is to discuss community policing strategies and to hear an update on the police chief selection process. Mirkarimi earlier had named a number of senior police captains who were notified that they would not be given an interview as part of the selection process. At the same time as those notifications went out, the Police Commission was holding public meetings stating it was seeking community input on the criteria for a new police chief. That criticism surfaced in news reports, initially in CitiReport but also in the San Francisco Examiner and SFAppeal.com. The San Francisco Chronicle, which has run two news stories and two columns by C.W. Nevius, has either not told readers of the brewing controversy or suggested that complaints were not being welcomed by the Police Commission and would be harmful to the process. Among those complaining that they had not been heard before the Commission began eliminating applicants widely regarded as highly qualified were representatives of the Department’s minority and women’s officers, including the Women’s Officers Network. The Commission did meet in advance with the San Francisco Police Officers Association. One explanation for the preferential treatment for the SFPOA might be found in their political and financial clout in San Francisco politics. 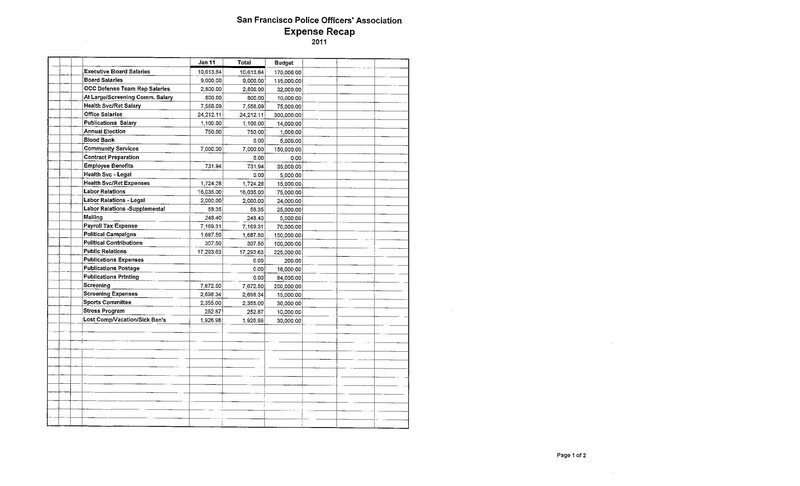 Documents obtained by CitiReport show that the San Francisco Police Officers Association has a budget of over $3.2 million for the current year, with a total of $250,000 earmarked for political contributions and campaigns with an additional $225,000 public relations. Among those who were retained for public relations is Alex Tourk, a high profile former member of the Newsom Administration. No other organization, including other police officer groups, concerned with police issues can come close to that financial clout. The Police Commission has scheduled a closed door session on nominations for police chief on Tuesday, March 9 and again on Saturday, March 12. The Commission has indicated its intention to forward names to Mayor Lee by March 16.